King Min Pha Laung, the youngest son of king Min Bar, ascended the throne of Mraukoo in 1571 AD. He was called Min Pha Laung because he was born at the time of Ba Yin Gyi Pha Laung’s arrival in Mraukoo. He built a stone pagoda by Kyatkhat city gate near Anuma lake in the south of the palace. The pagoda is called Gawyewa pagoda. His grandson Min Kha Maung ascended the throne in 1612 AD and renovated the pagoda. The pagoda was roofed with the prayer hall. He donated the golden robe for the whole pagoda. The pagoda has four walls at the base and one has a proch. The figures of two Devas making obeisance to Buddha, were sculpted at both sides of the porch pediment. The figure of minister in the form of squatijng, was sculpted under the king figure. 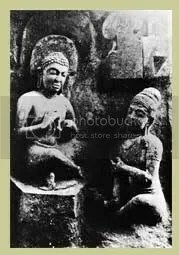 The stone Buddha image which is three cubits high, was erected on the stone throne in the perfumed chamber. The remains of the golden robe donated for the Buddha image, can still be seen until now. Nine stone bowls in the form of the lotus flower, were made previously on the throne to offer light to Buddha. The pagoda is called Minkhamaung pagoda as king Min Kha Maung renovated it. Nowadays, the department of archaeology restored it.